Dru runs a magical shop and though she sells many books, items and spells, unlike her mother, her magical power is limited. The one thing Dru wants to do is help people. When Greyson comes into her shop complaining about having dreams about the end of the world, Dru vows to help. What she doesn't realise at the time, is that she is signing up to save humanity because as luck would have it, Greyson is about to become one of the four horsemen of the apocalypse. It Happened One Doomsday is a cross between urban fantasy and paranormal romance. From the ending, it's clear that MacNaughton has more story that he wants to tell and so the rushed pace of this book combined with the insta love make absolutely no sense to me. MacNaughton could have taken his time and actually built his characters, thus making them feel real; however, after reading 280 pages I don't feel like I know anything real about them. The one thing Dru knows for sure is that she doesn't want a relationship with a sorcerer because of the instability that would result. She has settled into a relationship with Nate - a dentist. Dru worries that Nate's secretary is going to make the moves on him and the fact that despite the many things Nate has seen, he still doesn't believe in magic. Nate is as straight and white as a loaf of wonder bread. When Greyson walks into her shop, she's immediately attracted to him. He doesn't believe in magic either but there's nothing like growing horns on your head and having your eyes turn red to convince you that magic just might be real. Dru's angst between Greyson and Nick really comes down to her questioning what kind of life she wants to live. Nick leads to a house in the suburbs with 2.5 kids, a picket fence, a dog and no magic. It means security and safety. Greyson represents the road less traveled. There's no security because danger abounds and Dru will be forced to push her magical powers to their limits. The problem with all of this is that when the world is ending, it seems as though relationship angst could most certainly wait. Travelling to try to stop the fifth seal of the apocalypse from opening, is no time to be wondering which man you should choose. 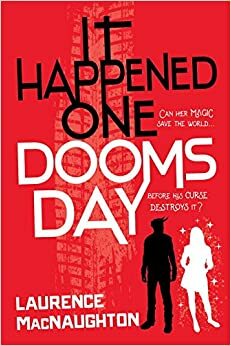 One of the things I did like about It Happened One Doomsday is the relationship between Dru and Rane. Rane is a sorceress and she spends her time wiping out evil in the world. Rane is Dru's ride or die girlfriend. When things get hairy, it's Rane who throws the punches and Rane who keeps realistic about the fact that no matter how cute Greyson is, or the promises Dru made to him that he still has a demon inside of him. Unfortunately, MacNaughton also occasionally tries to use Rane for comic relief as well and it comes off awkward and anything but funny. It is however nice to see two female characters sticking together, even if they did spend a lot of time talking about men and Dru's relationship, as the faced down the possible end of the world. The third character of note in It Happened One Doomsday is Opal, and she is Dru's employee at the magic shop. Opal is a black woman, and also happens to be the only character of colour in the book. Her portrayal is such a ridiculous caricature, it made me wonder if MacNaughton has actually met any living Black women? Opal is the fat, sassy black bff who irritated me every single time she appeared on the page. She's always just one step away from rolling her neck (with requisite hand on hip) and giving cut eye. The only thing we know about Opal is that she is in a relationship and that there are limits on what she'll do for pay. For the entirety of It Happened One Doomsday, Opal never rises above the level of a side character but I suppose I should be thankful given how God awful the portrayal is. There are no LGBT characters in It Happened One Doomsday. I suppose MacNauhton thought that having included a sassy Black character, he didn't have to worry about any other inclusion of minority characters. There's a lot of action in this book and I just found my eyes glazing over through it. I must admit that there were whole paragraphs that I just skimmed. In all fairness, lots of action has never been my thing and it isn't helped by the fact that none of the characters are really developed, so I had no real investment in their safety. It Happened One Doomsday attempts to be quirky but at the end of the day it's just meh. It's completely forgettable because nothing about it stands out in comparison to what's already available in the genre. It Happened One Doomsday is the book you pick up to read at the beach and quickly forget as soon as your finished.